To tell the truth, HBO has announced its new Big Little Lies TV show premieres Sunday, February 19, 2017 at 9:00pm ET/PT. The series is based on Liane Moriarty’s book of the same name. A subversive, darkly comedic drama, Big Little Lies follows three mothers of first-graders whose seemingly perfect lives unravel to the point of murder. Reese Witherspoon, Nicole Kidman, Shailene Woodley, Alexander Skarsgard, Laura Dern, Adam Scott, Zoe Kravitz, James Tupper, and Jeffrey Nordling star. Watch a preview, after the jump. Reese Witherspoon as Madeline Martha Mackenzie: A whirlwind of energy and good intentions, Madeline’s compulsion to set things right has unintended consequences. Nicole Kidman as Celeste Wright: The envy of her peers, statuesque beauty Celeste appears to have it all: twins, wealth and the perfect husband. Shailene Woodley as Jane: A single mom of modest means and a mysterious past, Jane is new to not only Monterey but to the complicated social hierarchy of Otter Bay Elementary School, where her son is a student. Laura Dern as Renata Klein: Powerful career woman and anti-bullying crusader, Renata is at the center of schoolyard politics on and off the playground. Alexander Skarsgård as Perry Wright: One half of the seemingly perfect Monterey couple, alongside his wife Celeste (Nicole Kidman), Perry is a successful businessman, loving father and devoted husband. Adam Scott as Ed Mackenzie: Stable and loving husband to Madeline, Ed’s approach is to play it safe. James Tupper as Nathan Carlson: Ex-husband of Madeline (Reese Witherspoon), he is married to a beautiful and younger yoga instructor, Bonnie (Zoë Kravitz) and faces the challenges of co-parenting a teenage daughter along with his ex. Zoë Kravitz as Bonnie Carlson: Married to Madeline’s ex-husband, spiritual yoga instructor Bonnie is a sensitive soul with a strong moral compass. EP David E. Kelley writes, and EP Jean-Marc Vallée directs. Witherspoon also executive produces with Bruna Papandrea, Kidman, Per Saari, Nathan Ross, and Gregg Fienberg. What do you think? 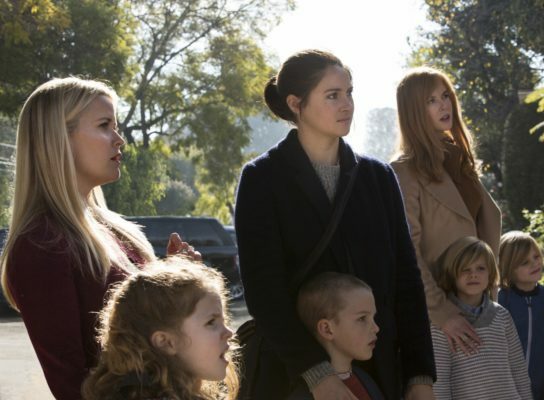 Did you enjoy the Big Little Lies TV series teaser? Do you plan to check out the premiere on HBO? Tell us. YES…YES…YES!!! Bring on the season 2# of BIG LITTLE LIES!!! I can’t wait… please hurry.